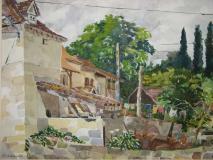 I organize French painting holidays, in the Spring Bank holidays and mid September. I take groups of ten to twelve students. The farmhouse that we stay in is called La Conche. It is situated in the valley of the Dordogne in south west France. It has four double rooms, two bathrooms, kitchen and large dinning/sitting room.If guests wish to stay in separate rooms they can be accommodated at a small house five minutes away in the village. All meals are served at the farmhouse and in the summer months we often dine outside in the garden. Our host Alan ,who is also a painter, will transport us to various beautiful painting locations in the surrounding countryside.